Gender equality by 2030 requires urgent action to eliminate the many root causes of discrimination that still curtail women’s rights in private and public spheres. For example, discriminatory laws need to change and legislation adopted to proactively advance equality. Yet 49 countries still lack laws protecting women from domestic violence, while 39 bar equal inheritance rights for daughters and sons. Eliminating gender-based violence is a priority, given that this is one of the most pervasive human rights violations in the world today. Based on data from 87 countries, 1 in 5 women and girls under the age of 50 will have experienced physical and/or sexual violence by an intimate partner within the last 12 months. Harmful practices, such as child marriage, steal the childhood of 15 million girls under age 18 every year. Women do 2.6 times more unpaid care and domestic work than men. While families, societies and economies depend on this work, for women, it leads lower earnings and less time to engage in non-work activities. In addition to equal distribution of economic resources, which is not only a right, but accelerates development in multiple areas, there needs to be a fair balance of responsibility for unpaid care work between men and women. Sexual and reproductive rights are critical in their own right. Shortfalls in these multiply other forms of discrimination, depriving women of education and decent work, for example. Yet only 52 per cent of women married or in a union freely make their own decisions about sexual relations, contraceptive use and health care. While more women have entered political positions in recent years, including through the use of special quotas, they still hold a mere 23.7 per cent of parliamentary seats, far short of parity. The situation is not much better in the private sector, where women globally occupy less than a third of senior and middle management positions. Oralia Ruano Lima was among the first women in her indigenous community to join an all-female entrepreneurship project as a beekeeper. Today the women beekeepers of Urlanta, a village in Guatemala, are bringing in sustainable jobs and income to their rural communities, and changing mindsets and attitudes towards women. Girls as young as seven flee female genital mutilation and other abuses in the Mara region of Tanzania, escape to a safe house which provides them shelter and protection. The UN Trust Fund to End Violence against Women has supported Amref Health Tanzania to launch an awareness raising and advocacy programme, aiming to end FGM practices. After attending leadership trainings, Abla Al Hajaia became the youngest City Council member in Jordan in 2016. Now, she uses her position to help Syrian refugees in her community and educate women on their legal rights. It took Irinea Buendía six years to get justice for her daughter’s murder, but her pursuit of justice led to a historic precedent in prosecuting femicide in Mexico. UN Women is supporting government institutions and civil society organizations, so that together they can raise awareness and end impunity towards crimes against women and girls. What is the real value of unpaid work? Around the world, women do the vast majority of the unpaid work, including child care, cooking, cleaning and farming. This unpaid work is essential for households and economies to function, but it is also valued less than paid work. 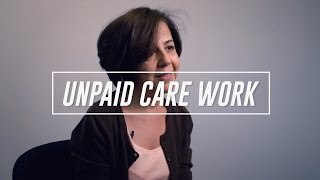 UN Women expert Shahra Razavi reveals the real value of unpaid care, and how we can reduce the burden on women by tackling entrenched stereotypes.